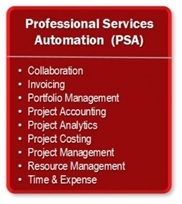 In my previous blog post, we did a quick overview of the IT applications that Professional Services Organizations (PSOs) are using to maximize profits. Now, let’s take a deeper dive into these applications and how they are benefiting PSOs. Financial management or enterprise resource planning (ERP) is the primary accounting solution required to accurately collect, bill, and report financial transactions. ERP provides the master general ledger database for accounts payable, billing, revenue and cash management. It sets the foundation for budgeting, revenue planning and forecasting by collecting and managing both revenue and cost information. Many ERP software packages include project accounting software, which is important for accurate tracking of professional services and professional services resource planning. Client relationship management (CRM) supports the management of client relationships to improve sales and marketing effectiveness. Based on a master client database, it records and manages the client opportunity lifecycle. CRM automates lead, contact and campaign management, sales pipeline forecasting and territory management. Opportunities are tracked through sales stages in which leads are converted into closed deals. As organizations mature, BI becomes a more critical tool to provide real-time visibility to all aspects of the operation, allowing executives to spot trends and take corrective action early. Trend and what-if analysis, and scenario and capacity planning help increase the accuracy of forecasting, planning and budgeting. 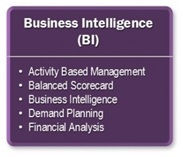 Refer to Table 4 to see the effectiveness of integrating BI with ERP. The winner: Integration Departments purchase applications to fulfill the need to improve internal operations. The process to speed time between quote and money in the bank is the most important business process in professional services. 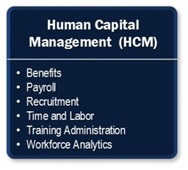 It requires integrated information across the core CRM, PSA, ERP and sometimes HCM solutions. With this information, sales and marketing better understand the resources available, while service delivery understands the time and cost required to deliver services.